Spin-type broadcast: For even spreading and productive coverage up to 54 ft.
One piece molded polyethylene hopper: Plastic construction to eliminate corrosion. Seamless for accurate and consistent emptying. Heavy-duty tubular frame: Supports the weight when full. Tow hook: Handles up to 1200 pounds. Shielded Front: Prevents spreading of material in front of the spreader. Stainless steel distributor vanes: Protects from corrosive material to enhance longevity. Adjustable distributor vanes: Four adjustable positions to obtain maximum spreading precision and uniformity. Plastic agitator wheel with steel arm: Standard equipment and should only be used when spreading light fluffy materials such as grass seeds and some light aerated powders that tend to bridge. Stainless steel orifice doors: Protects from corrosive material enabling doors to operate smoothly. Cat. 1 3-point hitch: For attachment to a wide range of tractors. Overall Dimensions: 37 in. x 40 in. 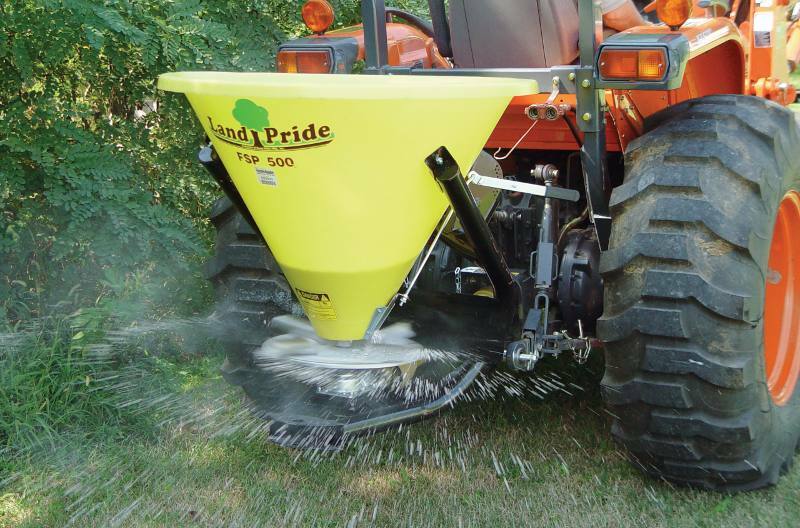 Net Spreadable Width - Granular: 39 ft. - 46 ft.
Net Spreadable Width - Crystalline: 20 ft. - 23 ft.
PTO Attachment Type: 1 3/8 in. 5.83 cu. ft.; 350 lb.